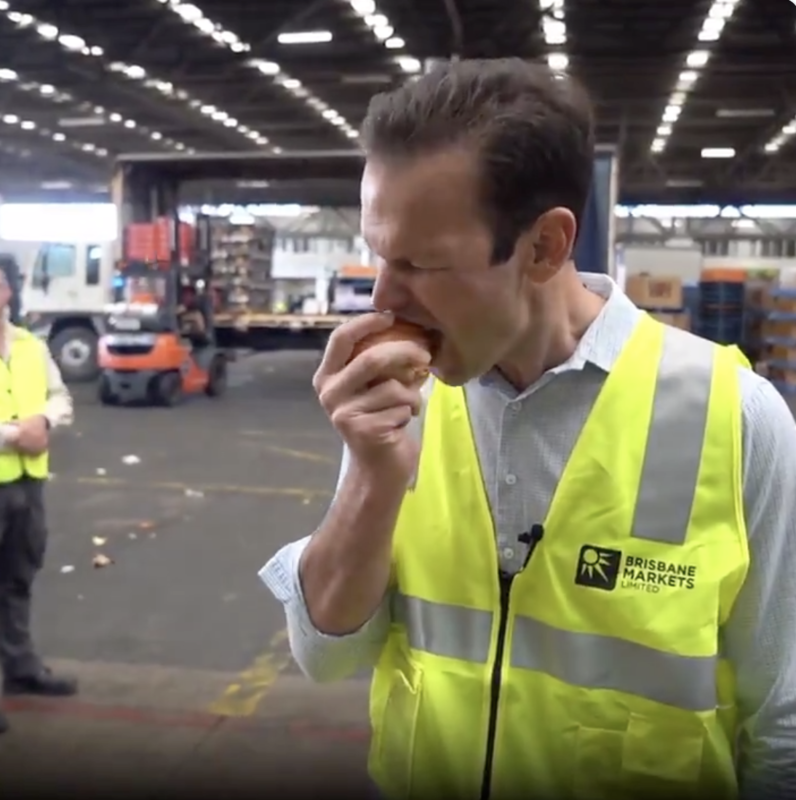 This is government minister Matt Canavan. 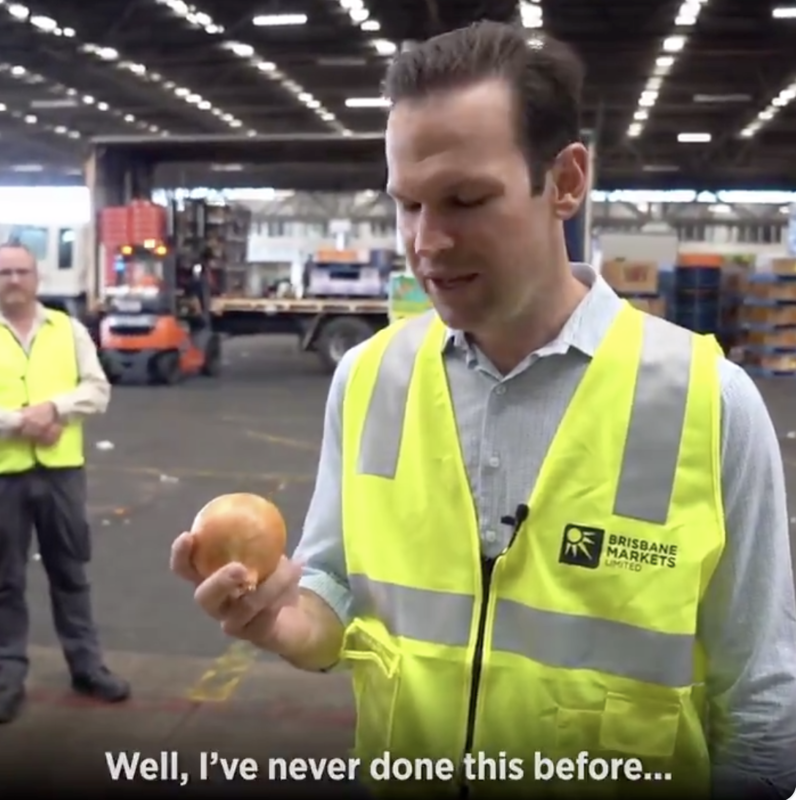 Now watch what he does with that raw onion. Maybe @TonyAbbottMHR is on to something here... @onionsaust, what do you reckon? Perhaps not the smartest move. If you're wondering why on Earth someone would do such a thing, here's Canavan's colleague, former prime minister Tony Abbott, in 2015. There's only one possible explanation for this totally normal behaviour: there must be an election campaign on. As you should know by now, Australia's next federal election will be held on Saturday May 18 and those eligible to vote have until this Thursday to enrol or update their details. You can do so here. Home affairs minister Peter Dutton issued an apology after accusing his Labor opponent Ali France of "using her disability as an excuse" for not moving to the electorate of Dickson. Prime minister Scott Morrison suffered a bit of miscommunication during his visit to the Sydney suburb of Strathfield. Here's Labor leader Bill Shorten watching the race on his phone on a bus. And here's Morrison again on Monday using Winx and the AFL to make an analogy about Labor's tax plan. Melissa Parke withdrew as Labor's candidate for the seat of Curtin over comments she made at a public meeting last month about the Israel-Palestine conflict. Parke was reported to have claimed Israel's treatment of Palestinians was "worse than the South African system of apartheid" and said a pregnant woman at a checkpoint was made to drink a bottle of bleach. In withdrawing from the contest, Parke said her views on the Middle East were well known but she did not want to be "a distraction from electing a Labor government". Labor had been hoping to make an impact in the Western Australian seat of Curtin following the retirement of Liberal MP Julie Bishop. The Liberals lost three candidates as the Section 44 nightmare claimed further victims. Shorten announced Labor did not have an "Armageddon agenda" in response to a headline in The Australian newspaper. Remember that fake GetUp character dreamt up by conservative group Advance Australia? Well this clip was tweeted and then deleted over the weekend. Seriously, can @TonyAbbottMHR direct his Advance Australia attack dogs not to rub up against photos of his political opponent? On Monday Advance Australia's national director Gerard Benedet said the video had been posted "in error". This happened. I don't know why. Morrison and Shorten were both in Melbourne on Monday. The prime minister was pledging extra funding for roads and Shorten promised more money for hospitals. The main story of the morning was the latest Newspoll, which found One Nation's primary vote has dropped to 4%. One Nation leader Pauline Hanson maintained she was unconcerned by the poll. The Australian reported an instruction manual for those hoping to represent Fraser Anning's Conservative National Party includes advice on how to answer questions such as "Have you stopped beating your wife?" Businessman Clive Palmer said he will pay out "millions of dollars" in outstanding entitlements owed to the workers of Queensland Nickel, which collapsed in 2016. Palmer, who has claimed his United Australia Party will contest every seat at the upcoming election, said today's announcement was not about politics and he wanted to reopen the refinery as soon as possible. "As Queensland's richest person..." he says. The Australian Electoral Commission launched a campaign encouraging voters to carefully check the source of any "electoral communication" they encounter. The $30 ScoMo/Big Mac mugs are out of stock. Outside of the federal campaign, we learnt former senator David Leyonhjelm had failed in his attempt to be elected to the NSW upper house. David Leyonhjelm unsuccessful in his bid to get elected to the NSW Upper House. Seems this Twitter bio was a bit premature. He did update that bio though. We've got just under five weeks of this and everyone seems super excited about it. Still at least there's Game of Thrones to take your mind off it. Or maybe not.